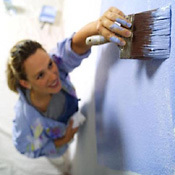 As we all know, painting is a pretty common home improvement topic. Although it is one of the simplest things you can do to improve the look of your house, it can be overwhelming when it comes to doing it right. I often find myself answering questions from clients and having to correct the advice they received from some of the big box stores. Be very careful when taking advice from a staff member at one of these stores. More often than not, they haven’t swung a brush for anybody but themselves. Some generic information can cause you extra time in labour and extra costs in dollars. Our advice is always free and always double checked for accuracy. If I don’t know the answer, I’ll find someone who does. And ultimately, you can bet that your trust in me is my utmost priority. Problems can range from product selection to tips on application. The most common mistake is often tied to the gadgets to use. Most of these self manifested "do it yourself" gadgets are not worth a dime if you want a quality job. We have tried and tested all different models and have found that they all fail in one way or another. The fact of the matter is, the painting trade still boils down to a person, a brush, a roller and a steady hand. That’s It! What Painting Questions do you have?